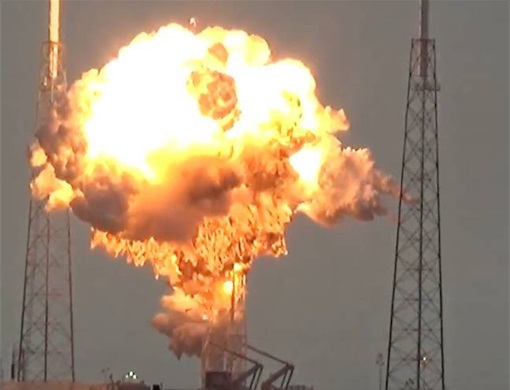 The SpaceX Falcon 9 rocket that exploded in a giant fireball on 1st September probably blew up because of a liquid oxygen tank breach. According a SpaceX press release, the accident investigation team (AIT) consisting of NASA, the US Air Force, the FAA, SpaceX, as well as industry experts is currently carefully examining about 3,000 channels of engineering data along with imagery, audio and video. The timeline of the event is extremely short, says SpaceX. The time that elapsed between the first signs of an anomaly to loss of data is approximately 93 milliseconds, i.e. less than one tenth of a second. The explosion occurred while ground crews were fueling the rockets for a short test-firing of its engines, two days before the official lift-off date. SpaceX stands for Space Exploration Technologies Corporation – it is an American aerospace manufacturer and space transport services company. Most of the debris from the explosion has been recovered, photographed, labelled, catalogued and has been placed in a hangar for inspection and use by the team of investigators. SpaceX engineers say that so far, a preliminary review of all the data and debris points to a large breach in the cryogenic helium system of the second stage liquid oxygen tank. Investigators have continued inspections of the LC-40 – Cape Canaveral Air Force Station Space Launch Complex 40, the launch pad where the explosion occurred – and the surrounding facilities. While significant areas of the pad system were affected and damaged, the Falcon Support Building next to the pad remained intact, and per standard procedure was not occupied when the explosion occurred. The new liquid oxygen farm – the tanks and all the plumbing that hold the rocket’s super-chilled liquid oxygen – was not affected and is still in good working order. The RP-1 (kerosene) fuel farm was also mostly unaffected. Engineers say that the pad’s control systems are also in good condition. SpaceX says its other facilities, from the Payload Processing Facility at the Cape, to the pad and hangar at LC-39A are unaffected – they are located several miles from where the fireball event occurred. Work is underway at Pad 39A, the aim being to bring it online in November. Engineering teams have been in contact with SpaceX’s Cape Canaveral and Kennedy Space Center partners and neighbours, and have not found any evidence of debris leaving the immediate area of LC-40. At SpaceX’s head office in Hawthorne, California, its manufacturing and production is continuing in a methodical manner, the company says, with teams continuing to build tanks, engines and other systems, as they are exonerated from the investigation. In a Twitter message earlier this month, Elon Musk, founder, CEO and CTO of Spacex, asked people who had videos, photos or audio of the explosion to send whatever they could to [email protected] He said their material could be useful for the investigation. Elon Musk said the explosion of the Falcon 9 rocket earlier this month was a ‘huge blow’ for him.